Lubricant Marketers, are you tracking your goals vs. actuals, or do you even have a way (or known reason) to now? 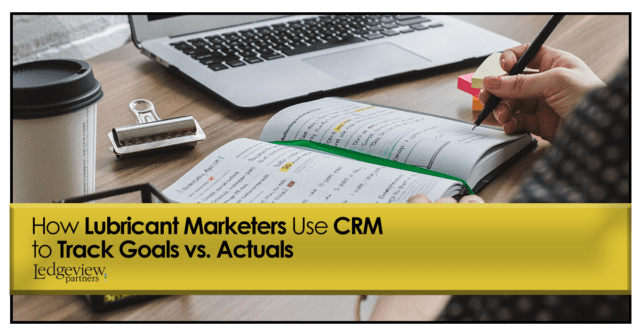 When you integrate your accounting (back office) system with CRM (with the right partner to help), and set goals with your CRM solution, you can join the group of Lubricant Marketers that are using CRM to track Goals vs. Actuals to drive efficiencies, meet their goals, and, best of all – create growth! It’s crucial that Lubricant Marketers track goals vs. actuals to see how far they are away from reaching their goals. Though you may have an idea, as a Lubricant Marketer, about how far away or close you are to reaching your goal in your head, your CRM system will provide the exact numbers. With CRM, you will see exactly where you are with meeting end-of-year quotas. This is crucial for a sales manager and salesperson in the Oil and Gas industry to have access to, and typically provides more motivation for them to chase the right opportunities. By comparing Goals vs. Actuals, Lubricant Marketers can manage their sales pipelines better, and see how close they are to achieving their goals, which we cover more in-depth in our new eBook, “11 Ways Lubricant Marketers Use CRM to Drive Success”. Lubricant Marketers can opt to analyze their Goals vs. Actuals based on Gross Profit or Volume. Though the function works the same in CRM once you choose one of these, the numbers will be different based on your selection. Remember, CRM is configurable to meet your needs. Even better, with tracking Goals vs. Actuals, Lubricant Marketers get a Goal Dashboard where they can track Goals vs. Actuals according to a brand or product category, whichever their preference is. They can also see how they are doing with growing their current business (a la Share of Wallet), or goals with new customers. The possibilities are expansive with CRM and create a lot of wins for your team and organization as Lubricant Marketers in the Oil and Gas industry.